Sorry my freebie posts have been on the sparse side lately. Truth is, I’m not finding anything I want. The free lists mostly include books I already have or don’t want. Plus, I took a trip to San Francisco last week and will be hosting a visitor for the next two weeks, so I’ve been preoccupied. I’m hoping by the time things slow down for me, the freebie lists will be full of fresh and exciting offerings. In the meantime, there are resources to help you look for free and bargain books. Check out the links in my sidebar. Also, you may want to grab the book listed below. It contains multiple sites where you can load up on free books. Enjoy, and if you find anything good, let me know! 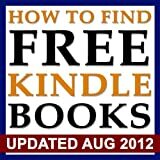 Did you know that you can find many free ebooks for Kindle each day? Sure, there are tons of sites that offer free ebooks such as the classics, and I feature many of those in this book, but there are many more free Kindle ebooks out there for you to download! I will show you the best sites to go to in order to find the hottest free Kindle ebooks each and every day! Find new authors and read tons of great free ebooks!